Golden Island Jerky recently launched three new pork jerky varieties and an additional beef jerky variety, all in the company's Asian & Taiwanese tradition. We have two of these new flavors, including this Sriracha Barbecue Pork Jerky, and the Kung Pao Beef Jerky. 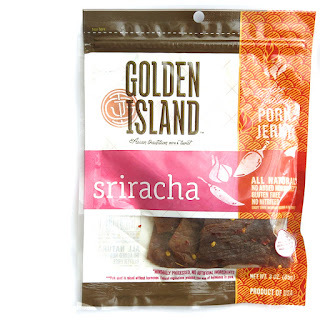 We originally reviewed Golden Island Jerky back in 2008, and then again in 2012 when they did a full rebranding. Since then, the company was purchased by Hillshire Farms in 2013, and then Hillshire Farms was purchased by Tyson Foods in 2014. Because of Tyson Foods' dominance in food distribution, Golden Island Jerky will be seeing increased market penetration, including Ralph Stores in Southern California. 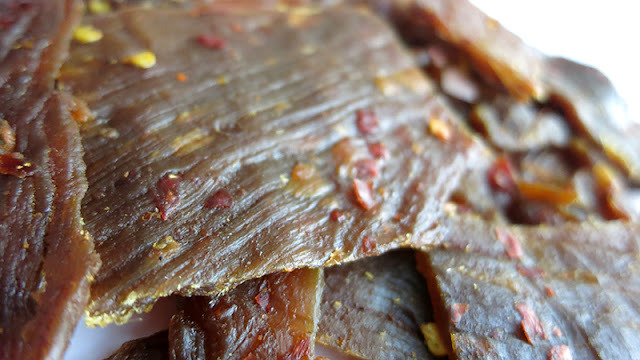 This Sriracha Barbecue Pork Jerky is described by the company as offering the "bold flavors of red chilies and garlic", and is "subtly hot and tender". Pork, water, brown sugar, sugar, gluten free soy sauce, salt, chili pepper, sriracha powder, chili powder, spices. The first thing I taste from these pieces is a strong sweet, followed by Chinese-style BBQ pork flavor. There's a noticeable heat building. The chewing brings on more of that Chinese-style BBQ pork, along with a light chile-sauce flavor and a substantial salt. For being dubbed, "Sriracha Barbecue Pork", this holds up somewhat. I taste something similar to Sriracha sauce, though lighter on garlic. But it clearly has that Chinese-style Barbecue pork flavor (pork char siu), with the classic Chinese 5-spice seasoning, marked by a noticeable clove. It's strong on the sweet. It also has a fair amount of heat that a Sriracha-inspired jerky ought to have. I'd rate the heat as "medium" on my personal scale (level 3 out of 5). 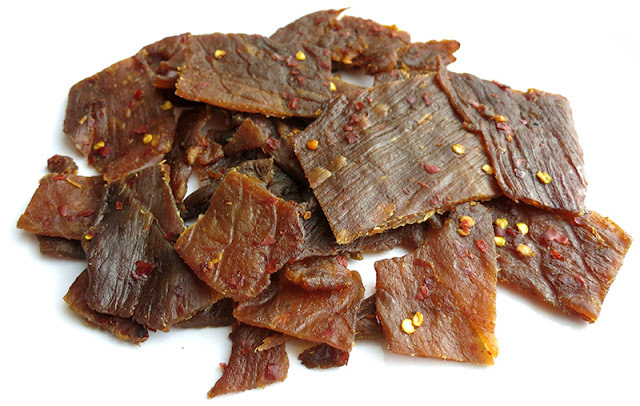 Otherwise, the primary taste profile of this jerky is that of Chinese-style Barbecue Pork, sweet but with more salt, and a noticeable red chile pepper seasoning. The meat consistency seems average for a national-brand jerky. It's chewy the way jerky ought to be, but tends to feel gummy perhaps due to the heavy marinade and sugars. It still has a meaty chewing texture, and feels "something like" real, pork meat. This Sriracha Barbecue Pork Jerky from Golden Island does a good job of representing the classic Chinese-style barbecue pork (pork char siu) flavor, and adds the flavor of Sriracha to create a spicy, red chile flavor. It has a fair amount of heat, but not too intense, along with a substantial sweet. I found the saltiness tasting too strong, despite the company claiming to be lower in sodium than most competitors. The chewing also feels somewhat gummy, I think from the heavy use of sugars. Overall, it's a good representation of a Chinese-style favorite, bolstered with the popular Sriracha flavor.